Can the Lair Co-Op Mode salvage Eternal Crusade's reputation? 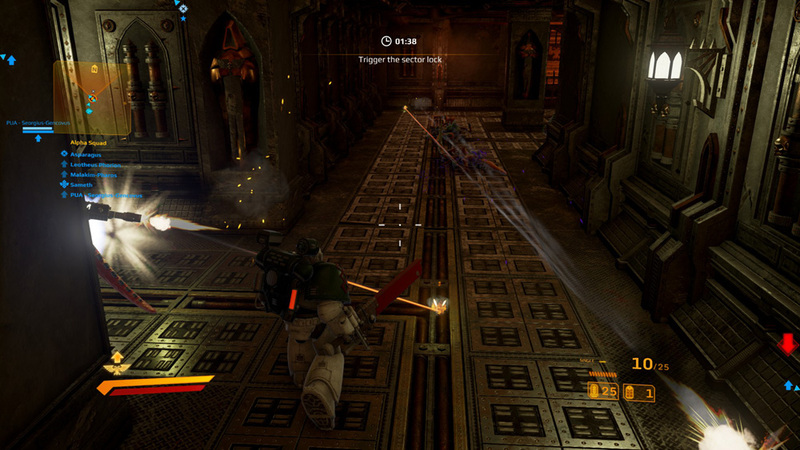 Many of you may not have known this, but Warhammer 40k: Eternal Crusade provides a co-op mode. 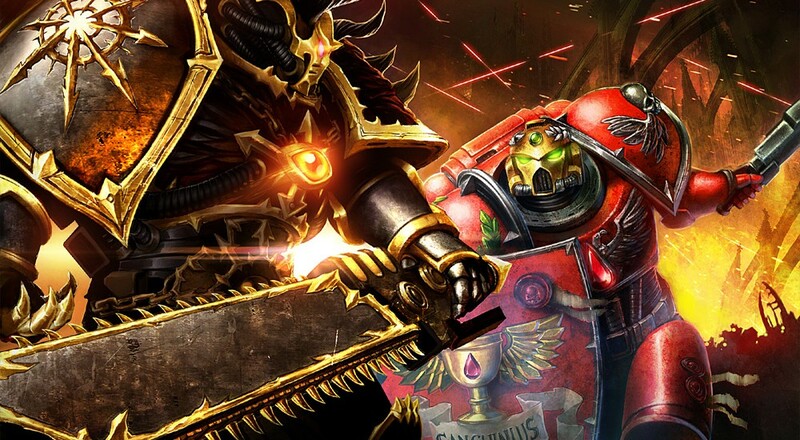 While the mode is not extensive enough to warrant a full review of the game, we thought a general impressions piece would be in order for those of you morbidly curious enough to brave the infamous reputation of Eternal Crusade. Eternal Crusade, the latest game released with a WH40k setting, advertises itself as an MMO. While it’s clearly “multi-player” and “online” (the “massively” is up for debate), it’s not an MMO in any traditional sense of the term. 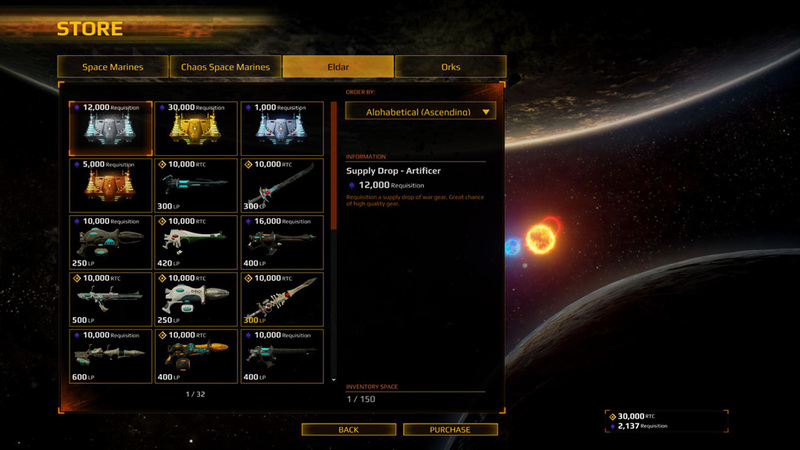 Players are provided four character slots on their account, where they can select one of four factions: Eldar, Space Marine, Chaos Space Marine, or Ork. 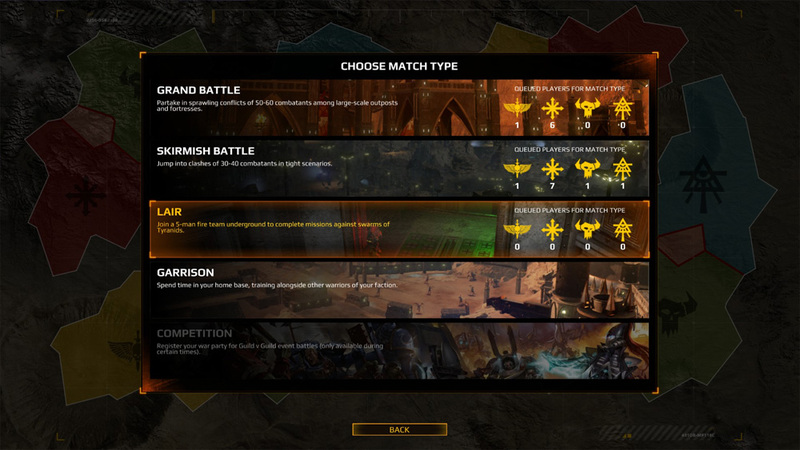 They are then further prompted to select a “Chapter,” which is a subfaction flavor to all you Warhammer buffs out there, but in this game only seems to have a cosmetic effect of determining your armor color. Eldar characters additionally have a male/female choice. After creating a character, players are presented with a menu which is their entire gateway into the game. The menu basically allows access to several different queues for various game modes. Most of these are competitive (this is Warhammer, after all! ), but one of them is cooperative. The Lair mode pits you and four other players of your character’s faction against a swarm of Tyranids. If you have friends you want to queue with, which you can do through creating a War Party, you will have to all make characters of the same faction. Otherwise, they will show up in your friends list, but flagged as a different faction, and thus cannot be invited to your party. After you get through the queue and into the lobby, you’ll be asked to select a loadout (basically a class) for the mission. These class presets will vary based on your faction. When everyone has loaded, selected their loadout, and readied up, the game will start. This all sounds very straight-forward and easy, but this entire process is where the mode all but breaks down. First off, Lair doesn’t seem to be a very popular mode (remember that the community is fragmented between several different modes), and the people queueing for Lair are even further fragmented by their faction. This can lead to some extremely long queue times. Then, when you get into the lobby, you need to wait for people to load into the game. Some people never do, and there’s no option to vote kick them from the lobby. Even if there was, I’ve never seen a player who left the lobby get replaced by a new player. Since the game won’t start with less than 5 players, if one person leaves, or never loads, the rest of the people in the lobby won’t be able to continue. The unpopularity of this mode begins to make sense. Provided you finally get through the queuing and lobby process, though, you’ll finally be able to play the game, which is a pretty run-of-the-mill horde mode. In Lair, you and your fellow players will progress through various floors and basically do a lot of capturing and holding points while time ticks down. 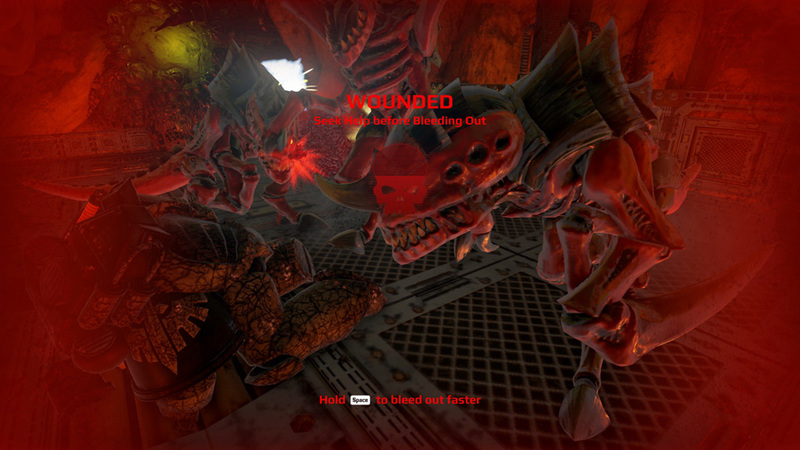 Tyranids will assault you in small waves, and sometimes at the end of a level you’ll get a mini-boss. Completing a level will prompt you and your team to get to the elevator so you can descend to the next level. Once everyone is there, any teammates who were killed during the level will be respawned in the elevator for the next round. Throughout the entire session, you’ll be receiving XP for killing enemies and healing teammates. At the end of a session, no matter how far you get, you will receive Requisition Points and perhaps Advancement Points (AP), depending on how well you did. 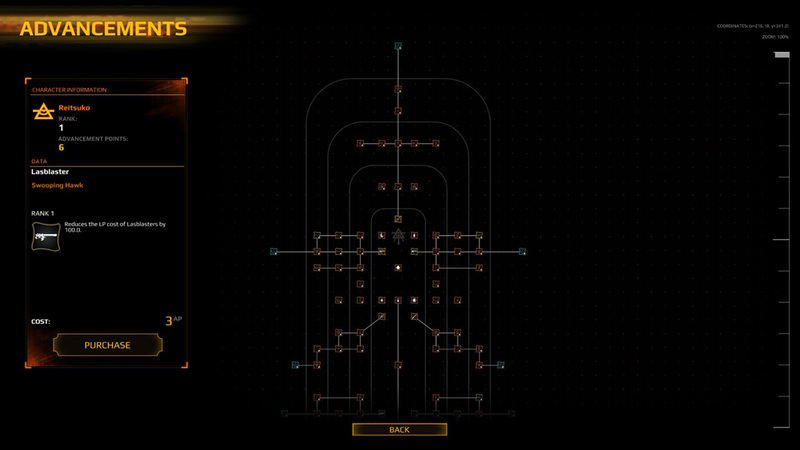 There are two different advancement systems in the game (XP and AP) and two different kinds of currency: Requisition Points and Rogue Trader Credits (RTC). Everything except RTC is character-specific. XP contributes to your rank and AP can be applied to your character’s Advancement grid (making certain weapons more effective, or unlocking passive bonuses). Requisition and RTCs are used in the in-game store, for either buying blind gear boxes or specific weapons or armor pieces. As far as I can tell, RTC can only ever be bought with real money, outside of the amount you start with. My account for the game started with 30,000 RTC and the lowest purchasable option is 4,000 RTC for $5. The most expensive RTC items are 10,000 RTC, and they appear completely cosmetic. Items in the store either cost RTC or Requisition, meaning that there is only one purchase option for each item. After playing many similar horde modes in other games, Eternal Crusade’s Lair mode is not one I’m likely to play again. The first reason is how Eternal Crusade handles in general. Animations are extremely rough and feedback from the game itself is poor. The game has a standard third-person shooter control schema with WASD movement, mouse-look, and point-and-click attacking. For most of my playtime, I played an Eldar Warlock who has a healing beam much like the Medic in Team Fortress 2. I found it to be unacceptably difficult to click onto teammates to heal them, especially when I wanted to click on a particular person in a cluster of people. The beam would just sometimes refuse to connect with them. One of my attacks was a sword swing, which would kind of just launch me out in a semi-random direction in front of me. Even the AI enemies have problems. One of the mini-bosses got stuck after one of my teammates was kiting him around the room, which did not make for a very satisfying experience. General gameplay issues aside, though, Lair is not an especially imaginative mode. Thematically, there’s nothing except the presence of Tyranids and the player factions that make it feel like Warhammer 40k. If one were to replace Tyranids with zombies and the players with general human survivors, nothing would really seem out of place, which is a shame. Part of what attracts people to Warhammer is the theme, and it just isn’t utilized to any great effect in Lair. Mechanically, there’s nothing new or interesting to differentiate Lair from other horde/survival modes and the levels do not appear to be procedurally generated. All sessions I played followed the same map and objective layout and featured the same waves of mostly indistinguishable Tyranids. Nothing really felt different between plays, except the skill of my fellow players. Eternal Crusade clearly had a lot of ideas going into it, and sometimes I’m able to see snippets of potential. For example, I really like the idea of only picking a faction as your character and being able to select your class at the start of a mission. I like the idea of tweaking your loadouts as you gain more gear while you play. These bits of potential, however, are not nearly enough to get the game by in a market crowded with horde/survival modes. The general gameplay experience and poor queueing system make the game feel like an alpha experience and demonstrate none of the polish I’d expect from a released and fully priced game. While I certainly hope the game continues to evolve in the coming months and become more player-friendly, I can’t recommend it right now in its current state. The mediocre gameplay of Lair is not good enough to bother with its frustrating queueing and lobby system. Warhammer 40k: Eternal Crusade is out now on PC and supports up 5-player online co-op play in the game's Lair mode. A copy of the game was provided to us by the game's publisher. Page created in 2.3025 seconds.